she's taken about a week so far and still isnt finished. forget when I'm on holiday and because my laptops doing "something spooky" as my brother would put it, it's a real PITA to post when I'm here, I keep leaving it upstairs and it's annoying to climb three flights just to get my laptop down. Not only that but because my phone is being weird with instagram at the minute some of the pictures I've taken need to be edited again on my laptop which again, is testing my already lazy nature. I've also been doing very little actual knitting since I got here mostly because Persona 5 partly because stellaris and partly because a bunch of my mini's arrived and I've been painting. 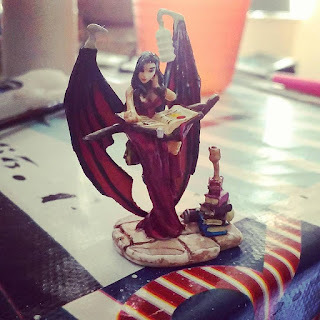 (Yes I paint mini's, yes that's like the lamest thing anyone can do, but really I only do it for display/I like painting, not for actual wargaming unlike the BF who is a much bigger dork than I am) My problem is I have about 20,000 different hobbies and I tend to have very intense periods of doing one a lot more than the others then I get distracted and drop it. I procrastinate my hobbies with more hobbies! For example the above paint project is actually a "side project" for my main project which is a giant dragon. And I havent started it as I can't decide on a colour scheme I've narrowed it down to either, black and blue, black and red, or white and blue. Buuuut I'm sure I'll figure it out when I get back to uni. I'm actually staying here longer than expected as the BF doesn't have to go home next week and I didn't want to abandon him to a house with only J*** (one of our housemates, he's fine but the BF wanted to have a longer holiday with me) in it. Anyway on with todays stitch. Pinnacle chevron. One of the prettiest patterns in the first chapter (possibly beaten by seeded chevron which is next up) it's a very nice overall texture. Because it's basis is a broken 2x2 ribbing the pattern also has a lot of lateral stretch. 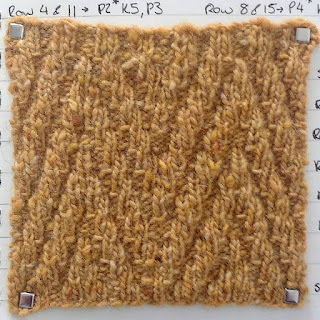 If left unblocked or blocked lightly the ribs tend to twist slightly, (a result of the moving purl stitches) and resembles a mock ribbing rounding out naturally, defining the chevron. I've added spacing to this pattern as I think it makes it easier to read. I will be doing more complex patterns this way from now on to save your eyeballs. This pattern is another cyclical one, (like the chevron pattern) where the second half is the inverse of the first half. 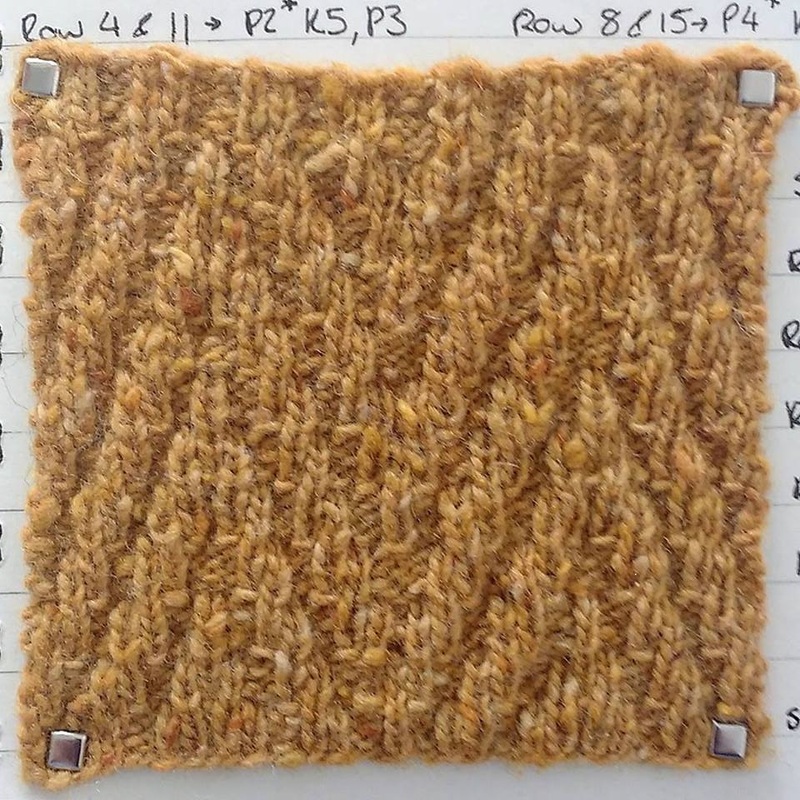 This pattern is also a good one if you want to practise "reading" your knitting as it's pretty obvious is you make a mistake. Anyway hopefully I will remember to do another blog post sooner rather than later. This week has been a pretty good test of how often I will post when I'm at university, as the only difference is I'll be doing lectures rather than just playing persona 5 and painting. I will likely post less if I have a lot of work to do (obviously) but twice a week is a pretty good rate for most blogs anyway. Good Luck and Happy Knitting!